WSJ: What guitars are you into now? 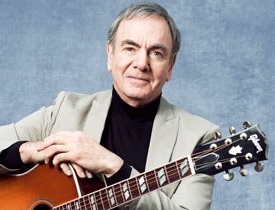 Neil Diamond: For the most part, acoustic guitars. They each have their own character and personality. On a particular day, I might pick one up and start noodling around, looking for some emotional content in the chords. I remember working on the “Home Before Dark” album , and I had pretty much all of it written. I went to visit a guitar collector. There was a 1953 Gibson that I picked up, and I liked a lot. I bought it on the spot at an outrageous price. I think I paid $11,000 for it. I wrote two songs on it. I have never written anything else on that guitar since. It served its purpose. It generated the creative character that I was hoping for. This entry was posted in Drum/Music News and tagged Gibson, Neil Diamond, Scott K Fish, Wall Street Journal. Bookmark the permalink.